The Hong Kong cruise terminal - known as Ocean Terminal - is where many major cruise ships dock in Hong Kong. It's not as modern as the newly unveiled Kai Tak Terminal, but what this hulking great warehouse lacks in architectural flare it makes up for with a fantastic location. The terminal lets you step from the ship straight into the heart of the Tsim Sha Tsui tourist district. Where is the Hong Kong cruise terminal? The cruise terminal is in Kowloon, perched on the Tsim Sha Tsui peninsula. This is tourist central for Hong Kong and many of the city’s hotels, best museums and markets are in the area. Landing here means you are right in the heart of the city. Facing you across Hong Kong Harbour are the skyscrapers of Central and Hong Kong Island, just a short ferry or metro ride away. In a city that has spun a reputation for serious shopping, it’s somehow fitting that the cruise terminal is not only connected to a shopping mall but that it’s Hong Kong’s biggest. Harbour City has hundreds of shops as well as three hotels, a cinema and a ferry terminal servicing Macau and Pearl River destinations. Ocean Terminal itself has only basic facilities but in the shopping mall, you’ll find ATMs, money exchange counters, and a post office. Particularly useful is the shoppers' concierge service, which offers free local phone calls and fax, mobile phone charging and other services. You are right in the center of the city so there is no need to eat in Harbour City although there are dozens of restaurants both inside the terminal and on the waterfront. A few even have a Michelin Star attached to their name. Some of the highlights include BLT Steak, an American-style steak house, the acclaimed Super Star Seafood restaurant and Dan Ryan’s Bar and Grill. There are also chains, such as Pizza Express and Ruby Tuesday’s. Most of the shops in the shopping mall close up at around 9 pm but restaurants open later, usually midnight on weekdays and 11 pm on Sundays. Further afield you’ll find fantastic Indian food in Chungking Mansions and great Cantonese street food around the streets of Mongkok. Food at both these locations is served late. The ferry terminal is very well situated for local transport. The Star Ferry that connects with Central docks just to the east of Ocean Terminal and in front of the Star Ferry terminal are dozens of local bus services. More useful is the MTR, Hong Kong’s metro system. The nearest stop – Tsim Sha Tsui - is minutes away from Ocean Terminal. A lot. It really depends on how much time you have. 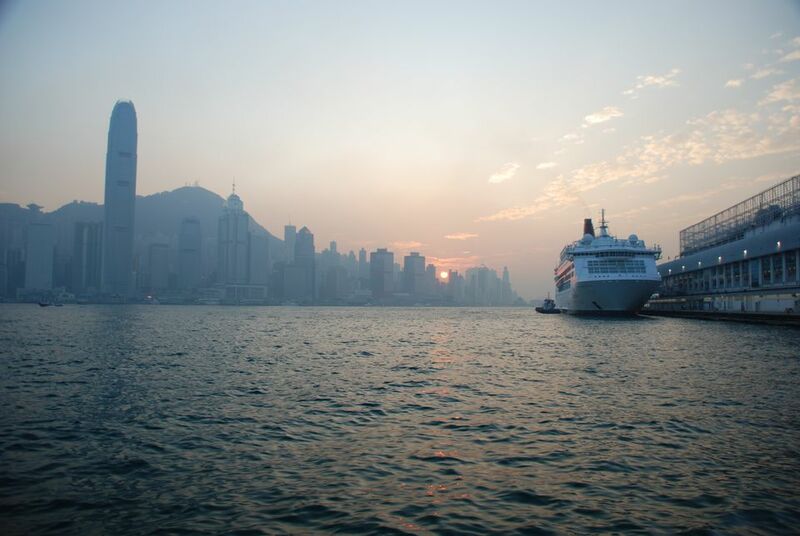 If you’re in town for a day, try our one day tour of Hong Kong which will whisk you through the major sights. On your checklist should certainly be a trip on the Star Ferry taking in the view from the Peak and watching the Symphony of Lights from the Tsim Sha Tsui waterfront. Also recommended is tasting the best Dim Sum in the world, sinking pints on the party streets of Lan Kwai Fong and snapping up a few bargains at the Temple Street Night market. For longer stays consider getting out of the urban jungle and seeing Hong Kong’s real one; from the island retreats of Lamma and Cheung Chau to the wildlife-filled ponds of the Hong Kong Wetland center.